This rare example of medieval architecture, originally from the Benedictine Priory of Saint John in west central France, once served the needs of a small celibate community of men engaged in a life of prayer, study, and reflection. The room was part of a self-contained monastic complex consisting of church, sleeping quarters, storage areas, common dining area, cloister walk, meeting rooms, and prior's (or director's) quarters. In the chapter house consisting of one room the religious community would gather daily to discuss its business affairs and assign the duties of the members. 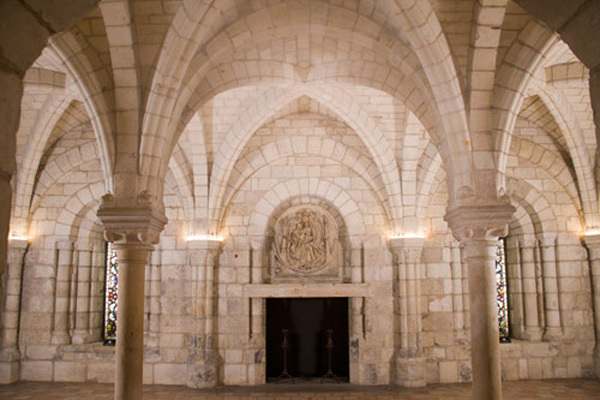 Common to French and Spanish regions, this twelfth-century architecture characterized by stone vaulted ceilings was the first development in western Europe to rival the sophistication of the Roman world. The ceiling is divided into six compartments of quadripartite vaults springing from piers in the four corners of the room and supported in the center by two monolithic columns. The visually dynamic division of the ceiling is echoed in the rounded forms of the windows and their columnar supports.